Vision is about hope, about how we look to the future with our eyes watching the work of our God who is already making all things new in our midst. Our diocesan vision reflects this hope and this focus. The people of the Diocese of Niagara are committed to following Christ passionately. We’re excited to be part of working for God’s justice and loving care for all people. Our lives are meant to reflect God’s own generosity as we care for our planet and the resources entrusted to us. We find joy in gathering to worship God, and in ways small and large we’re transformed by the experience of worship to follow more closely in the path of Jesus. We want to be open to trying new ways of being and refreshing and rejoicing in familiar ways, and to helping each and every person to share their time and talents to inspire one another in our shared journey. All of this work is rooted in the values we find in the scriptures as we seek to better know God. 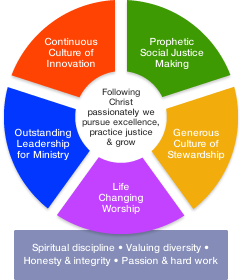 Our diocesan vision is less about a program and strategic objectives (though there are some of those for each of the petal areas), and more about ensuring that we’re always delighting and striving in the work of more closely aligning ourselves with God’s creative work in the world. You can learn more about how the diocese as a whole is living out its vision at the diocesan webpages, and we’ll be sharing details about how the Church of the Nativity is living out these values as our own webpages continue to evolve.